Harbormaster Spinnaker for HER - STØLÅS Watch Co.
Click the button below to add the Harbormaster Spinnaker for HER to your wish list. 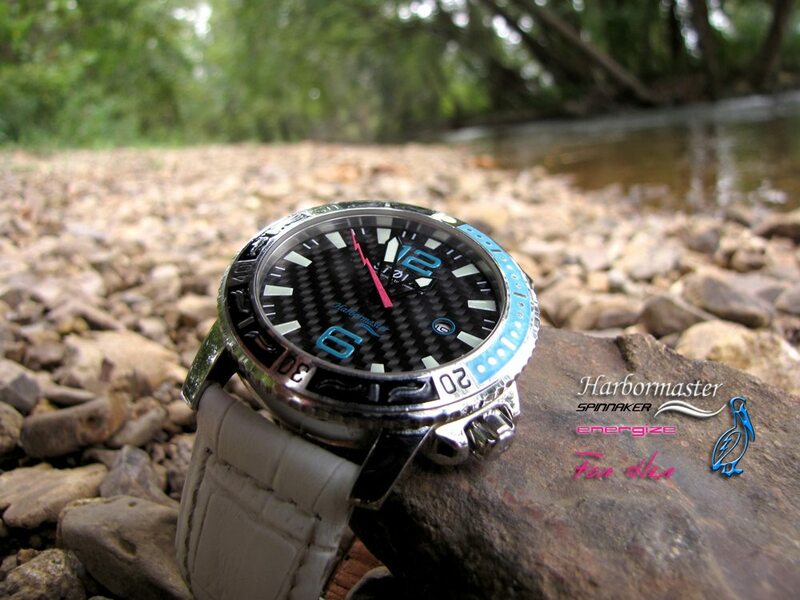 The Spinnaker features a beautiful carbon fiber dial that begs the sun's rays to dance upon it. With it's pleasant teal blue colors on the bezel and numbers and an elegant Hot Pink lightning bolt second hand-- its no wonder people stop to stare. The Special Energized Spinnaker is custom adapted for the Female enthusiast featuring the same specs as the awe inspiring Spinnaker with an added touch. The Hot Pink lighting hand and a beautiful White Leather Croc strap make this special Spinnaker a HOT watch for the lovely ladies. 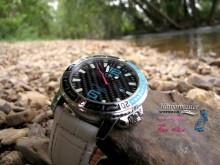 The combination of the two contrasting colors paired with the carbon fiber screams ocean lover. The movement this watch carries is built like a tank. Housing an Swiss ETA 2824 or Swiss 1198 quartz engine, designed for both ruggedness and precision time keeping, the Swiss quartz movement excels as a workhorse and is perfect for those who are serious adventurists. However, the beauty doesn't stop there. When the sun sets, the Spinnaker's photoluminescence properties are just getting warmed up. The Spinnaker features four different luminescence paints that all contribute to the awe inspiring brightness the watch has to offer. So, whether it be work or play, the Spinnaker will provide you with a vital instrument for your life adventure.